When is a supernova not a supernova? The brightest supernova on record was discovered in 2015 by the All Sky Automated Survey for Supernovae (ASAS-SN). Named ASASSN-15lh, this remarkable event – what looked like a huge brightening of a star in a distant galaxy – was observed by many other telescopes, including the Hubble Space Telescope and the Las Cumbres Observatory network. With careful study, it became apparent that ASASSN-15lh was not quite what it seemed. 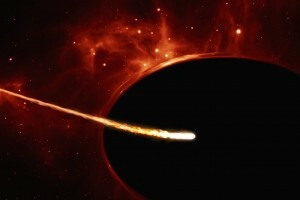 Rather than being the explosion of a massive star, it is now thought that it was the final flash as a star was swallowed by a supermassive black hole. This month, Morgan Fraser, from University College Dublin, and Las Cumbres Observatory’s Edward Gomez explain the story of this discovery – and rediscovery! We finish with a brief recap of 2016, and a look forward to 2017. Originally broadcast on 19th December 2016 as part of Pythagoras’ Trousers on Radio Cardiff. This entry was posted in Media, Radio on December 19, 2016 by Chris North. I am an Ogden Science Lecturer and STFC Public Engagement Fellow at Cardiff University's School of Physics and Astronomy.